Sri Lanka - When the recent Commonwealth Peoples Forum was held for the first time in Sri Lanka, Live Productions Pvt. Ltd was contracted by another local company, Dynamic AV Technologies Pvt Ltd to provide the lighting in front of 500 invited guests at the historic Galle Fort. This comprised entirely of PR Lighting moving discharge and LED heads from their large inventory of the Chinese manufacturer’s fixtures. 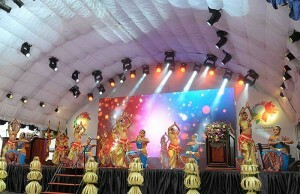 The lighting had to be purpose designed by the organising committee to meet the requirements of both the live audience — comprising the Secretary General Commonwealth of the Commonwealth, Sri Lankan president, Mahinda Rajapaksa, and various Ministers and Foreign delegates — as well as the television audience. As a result the fixtures first had to undergo camera tests. large quantities of PR Solo 575 fully-feature spots were specified, along with compact XL Beam 300 300W moving heads and super-bright XLED 1037s, each containing 37 x 10 Watt RGBW LEDs — plus some generic par cans on the overhead and side trusses. These were programmed into an Avolites Pearl 2010 to create different ‘looks’, which were assigned to the respective parts of the pageant provided for the guests’ entertainment. According to Live Productions’ Kapila Peiris this produced a combination of drama and mood change, with rich saturated colours. His company has achieved similar results with PR Lighting solutions in Colombo, stretching right across the island. In fact Live Productions have now boosted their hire fleet of PR Lighting effects by ordering eight pieces of the new XR 200 Beams (with ultra-bright Platinum 5R lamp), and six more of the popular PR Solo 575 moving heads (bringing their total of this Spot up to 22).